From the chaos of 1990s St. Petersburg to a Georgetown professional exchange program. 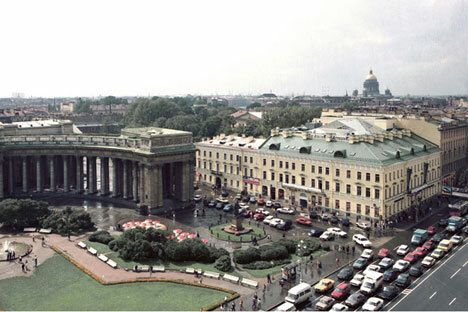 His project, The Atrium at 25 Nevsky Prospekt, consumed his life in the second half of the 1990s. “All in all, the idea was to turn the building inside out, and to make the central glass atrium the focus instead of the afterthought,” Williamson wrote in his entertaining memoir about the project, aptly titled “Inside Out” (Archway March 2014). The project would end, almost unbelievably, a success. Building a contemporary atrium linked to a historic building next to the Kazan Cathedral in the chaotic 1990s proved to be challenging and at times exasperating, however. Williamson coordinated financing, construction, leasing and property management through a tempestuous time. The Class A office building was completed and occupied in 1999. The story shows what Americans and Russians are capable of – even under the worst of circumstances. The architects on the innovative project and restoration included Sergey Sokolov, Nikita Yavein, Vitaly Anitpin, Pavel Sokolov and Eduard Tysherskiy of Studio 44 in St. Petersburg, with investment from the European Bank of Reconstruction and Development (EBRD). The development was rife with typical cultural differences and misunderstandings (from the difference in meaning between water-resistant and waterproof to the number of favors a developer has to offer the city). Fast forward 15 years, and Williamson, a youthful 51, has repatriated to Washington, D.C., and is an adjunct professor of real estate at Georgetown University’s School of Continuing Studies. One of his roles is to organize the content of a new exchange program between Georgetown University and The Russian Presidential Academy of National Economy and Public Administration (RANEPA). His fluency in Russian and “inside out” knowledge of Russian development is a clear hit with the Russian real estate professionals who came to D.C. on a recent exchange. As ma­naging director of Amber Real Estate, he acts as a liaison with the real estate community drawing from his own understanding of the current market. “We’ve had a great time,” said Dmitry Voloshin, a vice dean at the Russian Presidential Academy and a member of the real estate management faculty. “Quite a number of professionals have shared their expertise with us here,” he said. Williamson took the visiting real estate professionals and students to several development sites, including the new Mosaic District development in Northern Virginia. He also split the group in half and asked each of them to come up with a Request for Propo­sal to the city of D.C. regarding the redevelop­ment of a site in the increasingly trendy Eastern Market neighborhood. The nascent exchange program with RANEPA began when Georgetown Senior Associate Dean Christopher Metzler and assistant dean Katerina Kulagina traveled to Russia with the idea of starting a conversation about real estate and development. Metzler runs eight of the ten graduate programs in continuing studies. “We believe we can learn from the Russian Presidential Academy faculty,” Metzler said. “This is the beginning of a strategic partnership. Right now we are discussing with them in great detail how to develop the program,” he added. Metzler said that Georgetown hopes to add other partners in Russia as well. Metzler will be lecturing at the Presidential Academy in 2014 on topics such as Russia’s ascension to the World Trade Organization (WTO). After a particularly tense time, Williamson discovered the log-cabin sauna, or banya experience. His most unforgettable memory was also a teachable moment about how Russians like to unwind from a terribly long week. One of the most fascinating things about Russia is that the language is so precise, but the world it describes is so chaotic. There are a lot of relationships to try to figure out and if you can speak even some Russian you are way ahead. The hardest thing is to hear the side remarks that people make – those are often more telling than the translated speeches but hard to follow. If you get distracted by all of the things going on around you, it will be that much harder to get anything done. You can be aware of things without getting involved, like a parent in the middle of a playground who doesn’t intervene in the game unless there is a danger. I used to tell our team, “We are not here to change the world, we just want to build a building.” That approach helps get the building built and is less threatening to others. In the end, maybe in a small way, you have actually made a change. I was at a recent Georgetown event where a former leader from another university said that few people anywhere like change, but that many people will accept an experiment. I thought that comment was brilliant. Russia is a real place, not a fantasyland, but a place with real problems and real opportunities. I hope my book shows that all of the characters – Americans, Russian, Brits, Finns, Turks, Indians, etc. – are human. They have moments of greatness, and they make mistakes. From an educational point of view, I hope that readers can learn something about how developers try to take a dream and turn it into something you can touch and enjoy. I was really impressed by the extent of the projects all our RANEPA students were involved with. There is certainly a much greater volume of investment in Russian real estate now than 15 years ago; and it is more spread out. Russian developers also play a much larger role. There may be less need for a 35-year old expat American to manage a project in Russia. On the other hand, there may be greater opportunity for someone to work with foreign investors trying to better understand this emerging market. On April 10 at noon, Georgetown University will host a Book Talk discussing “Inside Out” by Glenn Williamson. The talk is sponsored by the CERES and will be held at the Edward S. Bunn S.J. Intercultural Center, McGhee Library.